When you search for backflow cages online, you may notice a trend. Most websites that sell cages are advertising them loudly and proudly as theft protection. We've talked pretty extensively about how backflow cages aren't the most effective choice when it comes to theft protection. Since thieves can see through them, and easily cut through them with the same tool they'd use to cut the backflow off, we strongly suggest using a backflow enclosure instead. But enough about that, you're here to find out when a cage is enough. There are a few factors that when added together, it makes complete sense to install a cage instead of an enclosure. While each factor alone would make a cage feasible, it takes all of them together to make a backflow cage the best solution. While we don't recommend using a cage when the backflow device needs to be present year round - whether you live in an area that frequently freezes or not - you can get away with it if the line is shut down for the winter and the device gets removed. This is really only an option for irrigation lines. Here is an outline of how this is done from SprinklerWarehouse: Turn off the Water, Shut Down the Controller, Drain the Water. There are a couple different ways of draining the water from the lines, sprinklers, and backflow device itself. Most likely you'll need to hire an irrigation specialist to do this for you. In terms of theft protection, the bigger the device, the bigger the temptation. Installing a large device in a see through cage may be much more tempting to thieves and vandals than a small device. Additionally, you're much more likely to find cages for smaller devices. 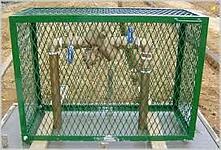 If you look at the cages available on supply websites, you'll see very few that would work for a 3" or larger backflow device. Some companies do offer "extra large" cages that are up to 4 feet long and 2.5 feet tall. You can possibly find even larger sizes, but it seems that manufacturers consider them a custom product. Backflow preventer enclosures are typically the best solution for commercial and industrial applications. 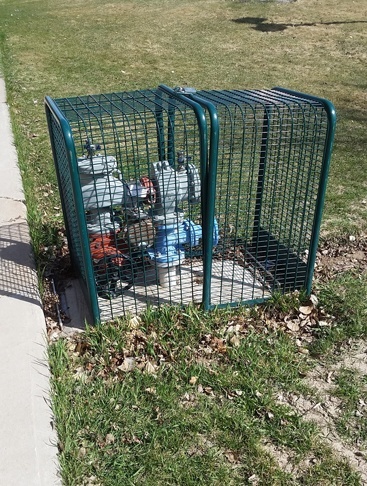 However, if your municipality requires backflow preventers on residential irrigation lines, and you're responsible for purchasing and maintaining that valve yourself, a cage probably makes a lot of sense. Cages are just as easy to disguise with landscaping as a colored enclosure. Most are available in green or tan so should fit right in with your yard's landscaping. This is really the only situation where you're more likely to appreciate your cage more than an aluminum enclosure. Actually, if this is the case, your backflow device is probably for 2" or smaller and you only use it seasonally meaning that a cage is probably the best solution for you. Unless your backflow device is installed at your home, and therefore hits all the points mentioned above, you will most likely be better off going with a heated enclosure for protection. Aluminum enclosures offer superior theft protection as the enclosure completely hides the device as well as protects it with a locking mechanism. In addition to this protection, it provides frost protection due to insulation or freeze protection via a heater. Better protection also leads to a longer lifespan for your backflow preventer, as it isn't being subjected to the elements.